A portion of the west rim of Endeavour crater sweeps southward in this color view from NASA's Mars Exploration Rover Opportunity. PASADENA, Calif. ï¿½ After a journey of almost three years, NASA's Mars Exploration Rover Opportunity has reached the Red Planet's Endeavour crater to study rocks never seen before. On Aug. 9, the golf cart-sized rover relayed its arrival at a location named Spirit Point on the crater's rim. Opportunity drove approximately 13 miles (21 kilometers) since climbing out of the Victoria crater. "NASA is continuing to write remarkable chapters in our nation's story of exploration with discoveries on Mars and trips to an array of challenging new destinations," NASA Administrator Charles Bolden said. "Opportunity's findings and data from the upcoming Mars Science Laboratory will play a key role in making possible future human missions to Mars and other places where humans have not yet been." Endeavour crater, which is more than 25 times wider than Victoria crater, is 14 miles (22 kilometers) in diameter. At Endeavour, scientists expect to see much older rocks and terrains than those examined by Opportunity during its first seven years on Mars. Endeavour became a tantalizing destination after NASA's Mars Reconnaissance Orbiter detected clay minerals that may have formed in an early warmer and wetter period. "We're soon going to get the opportunity to sample a rock type the rovers haven't seen yet," said Matthew Golombek, Mars Exploration Rover science team member, at NASA's Jet Propulsion Laboratory (JPL) in Pasadena, Calif. "Clay minerals form in wet conditions so we may learn about a potentially habitable environment that appears to have been very different from those responsible for the rocks comprising the plains." 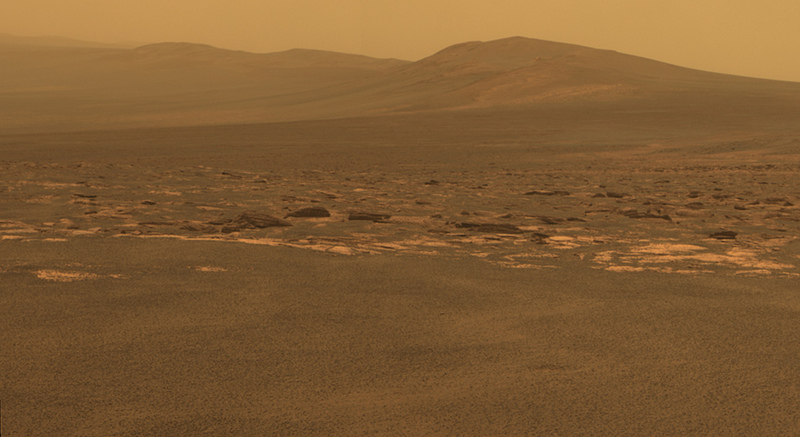 The name Spirit Point informally commemorates Opportunity's twin rover, which stopped communicating in March 2010. Spirit's mission officially concluded in May. "Our arrival at this destination is a reminder that these rovers have continued far beyond the original three-month mission," said John Callas, Mars Exploration Rover project manager at JPL. NASA's Mars Reconnaissance Orbiter, which launched Aug. 12, 2005, is searching for evidence that water persisted on the Martian surface for a long period of time. Other Mars missions have shown water flowed across the surface in the planet's history, but scientists have not determined if water remained long enough to provide a habitat for life. NASA launched the Mars rovers Spirit and Opportunity in the summer of 2003. Both completed their three-month prime missions in April 2004 and continued years of extended operations. They made important discoveries about wet environments on ancient Mars that may have been favorable for supporting microbial life. Imagery taken after Opportunity arrived at Endeavour will be released on NASA's website and NASA Television as soon as available on Wednesday. 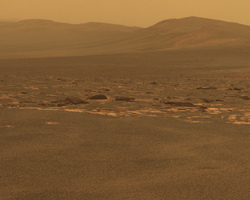 For more information about the rover and a color image as it approached the crater, visit: http://www.nasa.gov/rovers and http://marsrovers.jpl.nasa.gov .